A Volkmann's contracture is deformity of the hand, fingers, and wrist which occurs as a result of a trauma such as: fractures, crush injuries, burns and arterial injuries. Following this trauma, there is a deficit in the arterio-venous circulation in the forearm which causes a decreased blood flow and the hypoxia can lead to the damage of muscles, nerves and vascular endothelium. This results in a shortening (contracture) of the muscles in the forearm. The bones are an important factor in a Volkmann's contracture. We can see that the humerus of the upper arm is often involved in Volkmann's contracture. A fracture of the supracondylary space causes a deficit in the circulation of the arteria brachialis. It is caused by the blocking of the circulation and deficit in supply of blood that the muscles and nerves malfunction. There is a contraction of the muscles. The muscles who are usually involved are the flexors of the wrist. Yet there is also a contracture occur in the extensors of the wrist, but this is less common. The incidence of Volkmann’s contracture is low. It counts 0,5%, which means it is a rare disease. The intracompartimental pressure occurs when there is a bulging caused by a trauma. Thus, there is not enough space for muscles, nerves and blood vessels that lie within this fascia. This results in vascular defects and defects on nerves. Possible causes can be animal bites, fractures of the forearm, bleeding disorders, burns, excessive exercise and injections of medications at the forearm. Bleach view at the level of the skin (pallor). 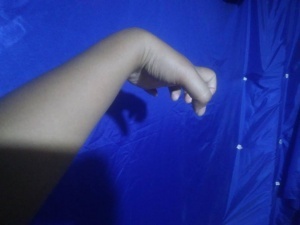 It is possible that the pulsations can not be felt in the swollen arm, mainly in the distal part (pulselessness). There are also neurological limitations noticeable from the muscles that pinch the neural pathways, there is a decreased sensation (paresthesia) and there is an observable motor deficit (paresis). For a Volkmann’s contraction, the findings are specific as described in clinical presentation subheading above. The main physical picture that we see is a neurological deficit that occurs in the nerves that pass in the affected regions. The flexion of the wrist is a result of contraction and a loss of innervation. MODERATE: All fingers are flexed and the thumb is oriented in the palmar orientation. The fist in this case can remain permanently in flexion and there is usually a loss of sensation in the hand. SERIOUS: all muscles in the forearm (flexors and extensors) are involved. This is a serious limiting condition. An objective test to evaluate the ischemia and the pressure in a muscle compartment is an invasive test. It measures the absolute pressure in the compartment of the muscle. This is also called the intracompartimental pressure monitoring (ICP). Prevention is the best management in this condition. Often times, the management require the surgical and physical therapy intervention for a better outcome. The majority of Volkmann’s contractures are caused by a supracondylar fracture, and It must be ensured that this fracture heals. when there is a intra-compartment pressure of >30 mmHg,an urgent fasciotomy is recommended to avoid further complications, Raised ICP threatens the viability of the limb and CS (compartment syndrome) represents a true medical emergency. Thus, the need for decompression by removal of all dressing down to skin, followed by fasciotomy- Surgical opening of the fascia around the muscles to make more place for the structures inside. 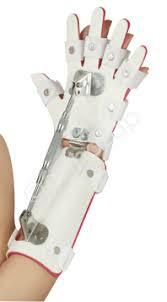 This is done to prevent the onset of Volkmann’s contractures. Progressive Splinting, passive stretching and tendon gliding, as well as massage could be use in mild to moderate cases of Volkmann's contracture. In moderate Volkmann's contracture, tendon slide and neurolysis surgery should be performed (median and ulnar) along with extensor transfer procedures. After the surgery, it is important to ensure that the mobility is recovered by passive stretching techniques, range of motion exercises to enhance soft tissue elasticity. An other part in the therapy is activating and strengthening the weak agonist to ensure equilibrium in agonist and antagonist pull during joint movement. By the use of an electomyographic device, the patient can train its affected muscles with cooperativity. The patient is more alert and there is more interaction between the patient and the therapist. Finally, in severe cases of Volkmann's contracture, debridement of injured muscle may be performed with releases of scar tissue and salvaging procedures. Range of motion and function after injury are improved by physical and occupational therapy. Early diagnosis and beginning of the treatment means much bigger hopes of successful outcome. ↑ 1.0 1.1 Von Schroeder HP et al. Definitions and terminology of compartment syndrome and Volkmann's ischemic contracture of the upper extremity. Hand Clin. 1998 Aug;14(3):331-4. ↑ H.J. Seddon. Volkmann’s contracture: Treatment by excision of the infarct. London, England; from the institute of orthopaedics. ↑ 5.0 5.1 nlm.nih.gov/medlineplus/Volkmann`s ischemic contracture Author: Linda J. Vorvick, MD, C. Benjamin Ma, MD, David Zieve, MD. ↑ Carson S, Woolridge DP, Colletti J, Kilgore K. Pediatric upper extremity injuries. Pediatr Clin North Am. 2006;53(1):41-67. ↑ 11.0 11.1 Stevanovic M, Sharpe F.Management of established Volkmann's contracture of the forearm in children. Hand clinics,2006;22(1):99-111.